Even though I am complaining about the cold, and unpredictable weather, I can't deny the merriment and joy of the holiday season with some great food and great company. As you know, I am from India, and I am not used to celebrating Christmas as a holiday, but after moving to the USA, we now look forward to this snow white Christmas holiday. I help my kids deck up the Christmas tree and enjoy their never-ending list for Santa. The last couple of years during Christmas I have always baked Christmas cake. This is a healthier version of the regular Christmas cake and is alcohol-free. I use wheat flour instead of refined flour and jaggery in place of white sugar. 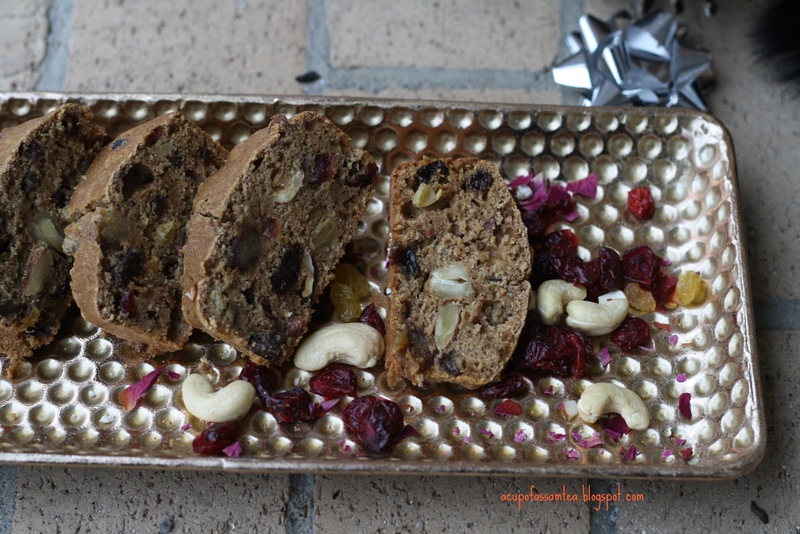 The cake is loaded with the goodness of dry fruit. My kids love it too. Great for after Christmas snacks, very filling because of the dry fruits. Do let me how you like it. Have a great holiday and enjoy the festive season. 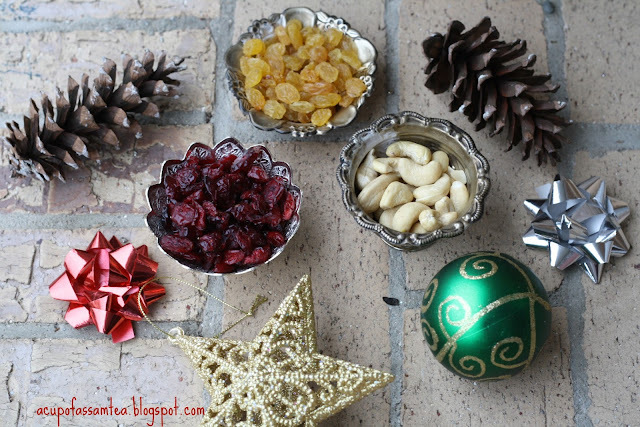 First, you need to soak the dry fruits no. 2 to 6 into grape juice for 2 to 24 hours. Sieve the whole wheat flour and add baking soda, cinnamon powder, nutmeg, and coffee. Boil water and let the jaggery dissolve. Switch off the heat and let it cool down and add it to the dry mixture. Now separate the fruits from the juice and add to the mixture. Add butter and mix it well. If you find the mixture is too hard, you can always add milk. Now, bake it in at 350 F for forty minutes. You can check with a toothpick. Once the toothpick comes clear, the cake is ready. 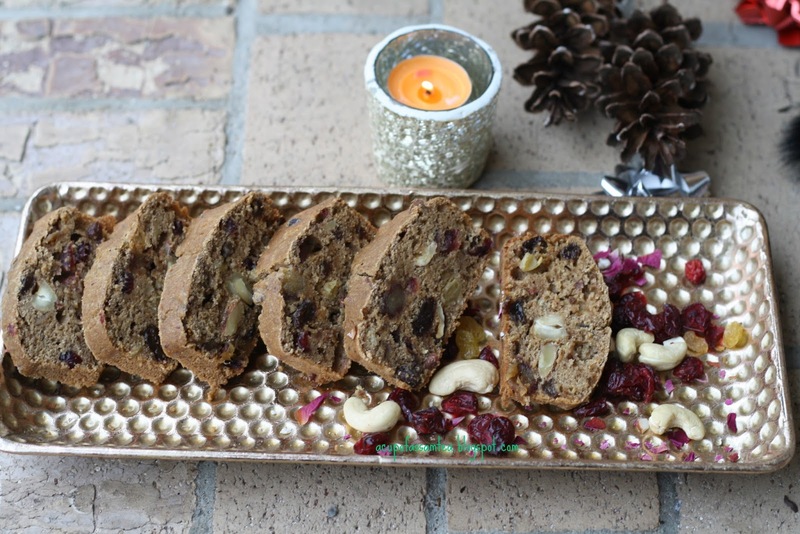 This sounds incredibly delicious and it’s full of everything I love with all those dried fruits and nuts. I’ve never heard of jaggery before - I need to check it out! Yum, this recipe looks super tasty and it contains some of my favorite ingredients! Jaggery is such a smart substitution for white sugar. I love that this is healthy and inviting! I love the substitute for table salt. This looks really yummy. The raisins and cinnamon powder must have added Indian flavour to it. North India has totally different culture than whole India.It is famous for its culture.I have visited Dibrugarh city of Assam last month .It was nice city i enjoyed its culture and lived that city. There i stayed in Hotel Rainbow Regis provides Online Hotel Booking in Dibrugarh, Assam .there i saw culture of Assam in Their food recopies, serving , hospitality etc. It’s akways a good idea to bring our culture into our current lifestyle.